Landfall, the nation’s leading marine outfitter and safety expert, is presenting a US Sailing certified Near Coastal Safety@ Sea seminar at Mystic Seaport in Mystic, CT on Saturday, February 7. This day-long, hands-on seminar provides both novice and experienced mariners with the skills and information needed to safely navigate coastal waters from Long Island Sound to Cape Cod and the Gulf of Maine. Seamanship, presented by Ralph Naranjo, an Annapolis School of Seamanship instructor and Technical Editor of Practical Sailor and regular contributor to Cruising World. The seminar will be held from 8:30 am to 4:30 pm in The River Room at Latitude 41º Restaurant at Mystic Seaport. For more information, visit landfallnavigation.com/sasmystic.html. 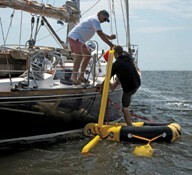 To register, visit mysticseaport.org/event/safety-at-sea-seminar. or call 860-572-5331.